The Industrial Revolution and westward expansion led to a tectonic shift in the way late 19th and early 20th Century people lived. Government responded with the Progressive Movement (Teddy Roosevelt led the charge) to help those who were negatively impacted by the onset of factories and the challenges of settlement. The age of technology (the late 20th and early 21st Centuries) has brought about a similar tectonic shift in the way we live. Expansion has been “virtual” and rather than moving westward, we’ve been settling the globe on an unprecedented scale. Now, factory smoke has been supplanted by innumerable “bits” of information that fill our living environment. Except, today’s government has not taken as much a role as the Progressive and New Deal activists of year’s past to respond to this shift and only time will tell if the populous will be worse off for its nonintervention. Schools adjusted to turn-of-the-20th Century changes by adapting curricula to keep pace with industrial and expansion needs. Science and mathematics were introduced on a greater scale and fused with the humanities (language and literature were the foundations of American curricula up until this point). 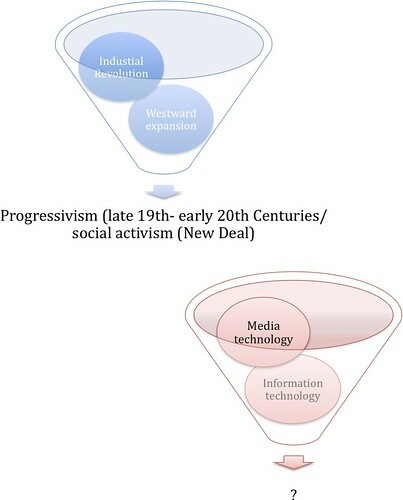 Today’s response to the onset of media and information technology has been assumed by the 21st Century curricula movement (see The Partnership for 21st Century Skills and others for the best examples of the way America’s schools have begun to shape their programs) and is working hard to influence how we prepare children for this new age. Prepare students to embrace new technologies we might, but how have schools and school districts changed the way they govern so that they combat the challenges 21st Century citizens will confront as this paradigm shift consumes our lives on the scale the industrial age and westward expansion did for 19th-20th Century citizens? There is much to say about the negative impact of technology on society. Maurice Elias and others talk about the profound challenge parents face in trying to raise self-disciplined, responsible, and socially skilled children as they confront the invasion of Facebook, Twitter, streaming video, and other omnipresent media in their lives. And while schools work hard to arm children and young adults with the tools they’ll need to be 21st Century citizens, preparation for the changing nature of our world appears to be lacking. The Progressives and New Dealers knew that American citizenry would need support to get along in a new industrial and expanded world. American school systems must implement the same measures to support its charges to embrace a new information and media-rich world successfully. It takes more than skills preparation to foster success in a new world. Today’s citizenry must be given the same tools and protections yesterday’s citizenry was provided. Schools should look beyond 21st Century Skills preparation (though important) and should consider how they can create policy and adjust the way they govern their programs to provide the support children and young adults to not only be prepared for the information and media age, but to survive in this new world.